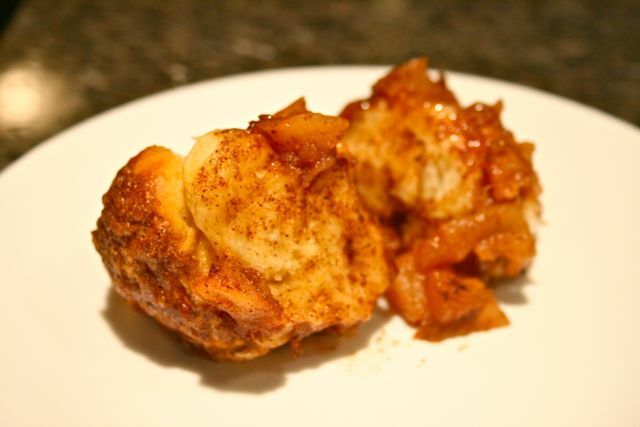 Apple pull apart monkey bread for a #SundaySupper Autumn Apple Party! 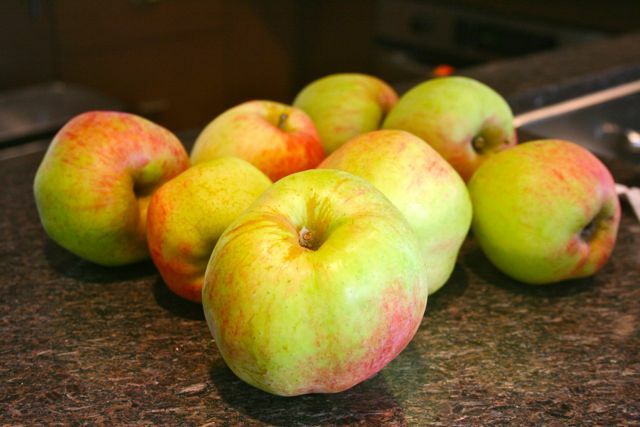 Yesterday was the first official day of Autumn and what better way to usher in this glorious season than to devote this week’s #SundaySupper to apples? While apples are enjoyed year round, to me it’s synonymous with fall. There’s just something about its syrupy, sweet, floral flavor, combined with cinnamon, nutmeg, and brown sugar, that feels so warm and cozy. I love having something studded with apples baking in the oven, filling my apartment with smells that remind me of cable knit sweaters, cool sunny days, and taking long afternoon walks with the feel of dried leaves crunching under my feet. This is the time when things simultaneously pick up and slow down – people are back from summer vacation, kids go back to school, there’s a renewed energy in the air but the trees are starting to drop their leaves, the temperature is reducing, and the world is slowly going to sleep in preparation for winter. Apples from the tree in a friend’s backyard. 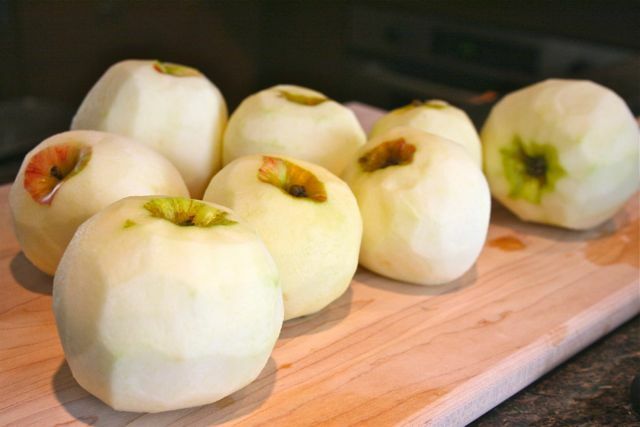 Apples are such a versatile fruit – you can put it in almost anything! 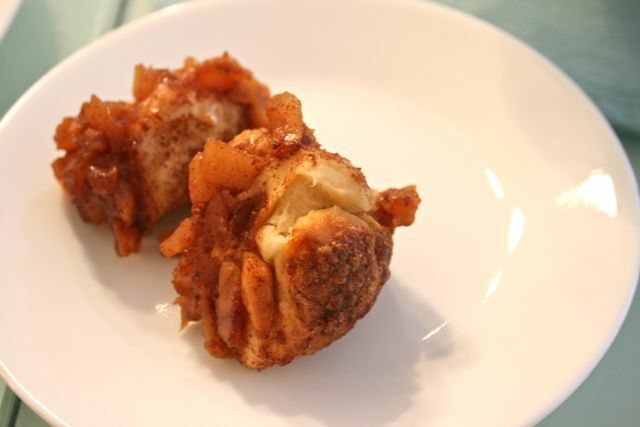 I’ve been wanting to make monkey bread for a long time and decided to put an apple cinnamon twist on it. What is monkey bread? After quickly checking with my good friend, Wikipedia, it’s a “sweet sticky, gooey pastry served in the United States for breakfast.” It’s “made with pieces of sweet yeast dough (often frozen) which are baked in a cake pan at high heat after first being individually covered in melted butter, cinnamon, sugar and chopped pecans. It is traditionally served hot so that the baked segments can be easily torn away with the fingers and eaten by hand” (source: Wikipedia). Seriously – forget about only serving this at breakfast. This is good at any time of day! 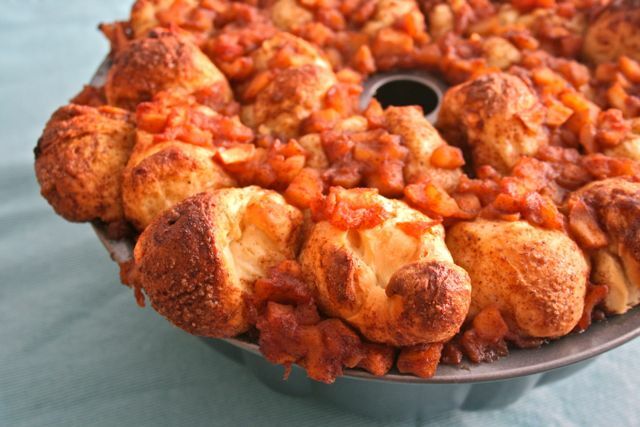 And according to Wikipedia, “the dish is still virtually unknown outside the United States.” This is definitely changing and for good reason – monkey bread is all kinds of amazing! Dough, butter, sugar and cinnamon all baked together to form a sweet, soft, gooey, sugar crusted pull-apart bread? Yes please! 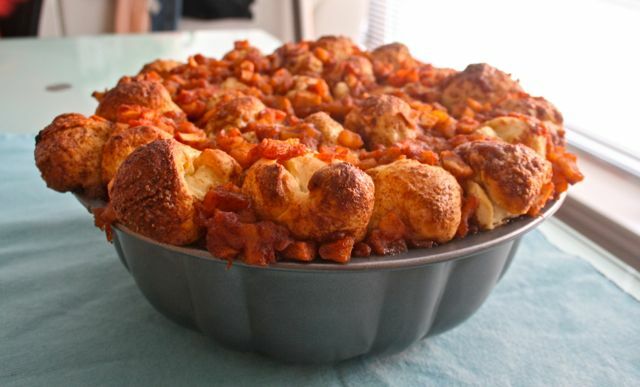 ***Update – after baking this and mulling over the recipe, I’ve been really bothered by the texture of the dough and how moist the monkey bread was after baking. Like I say below, I may have underbaked this but I also think part of the problem is how much sauteed apples I crammed in there. 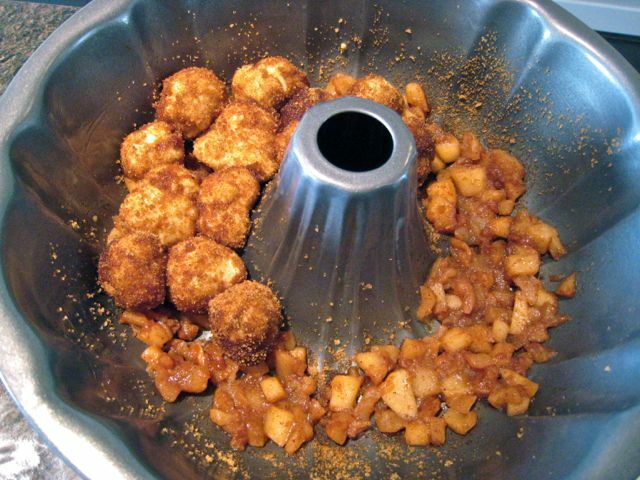 If I were to re-do this recipe, I’d halve the amount of sauteed apples and I wouldn’t line the bundt pan with them so that the monkey bread crisps and browns all around. Happy baking! 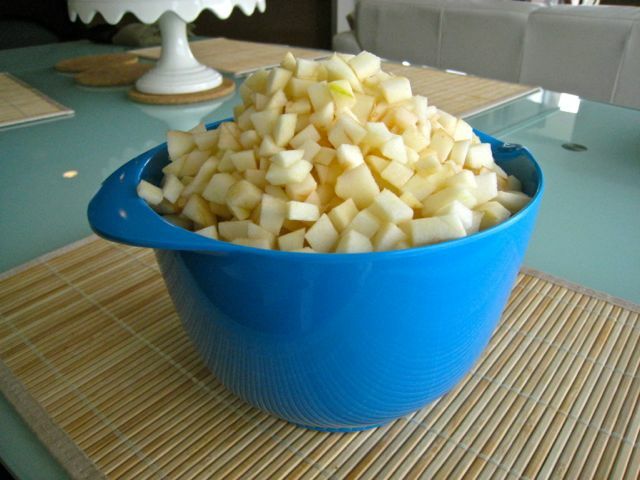 Melt the butter in a pan (I used non-stick) and then add your apples. After cooking them for a few minutes, add the rest of the ingredients. 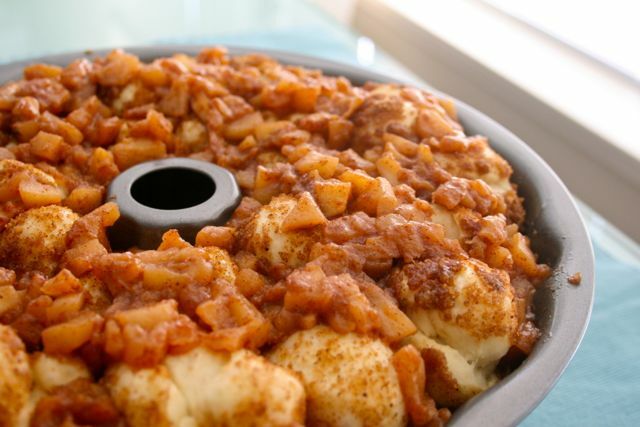 Cook for approximately 10-15 minutes – you don’t want the apples getting too soft because they’re going to bake with the monkey bread. Whisk the milk, water, butter and honey together in a large liquid measuring cup. Mix 3 1/2 cups of the flour, yeast, and salt in a stand mixer fitted with the dough hook. On low speed, add the milk mixture and mix until the dough comes together. Increase the speed to medium-low and knead until the dough is smooth and elastic, approximately 10 minutes (if after 5 minutes more flour is needed, add the remaining 1/4 cup flour in 1 tablespoon increments until the dough clears the side of the bowl but sticks to the bottom). I actually used the entire amount of flour (neglecting to read ahead!) and my dough turned out fine. You can either let the dough rise the same day or put it in the fridge for a slow rise. Because I made the dough late on Friday night, I put it in the fridge. After kneading it in the stand mixer for 10 minutes, transfer the dough to an oiled bowl, cover it tightly with plastic wrap and refrigerate for up to 16 hours. When ready to use, remove the dough from the fridge and let stand at room temperature for at least 30 minutes. 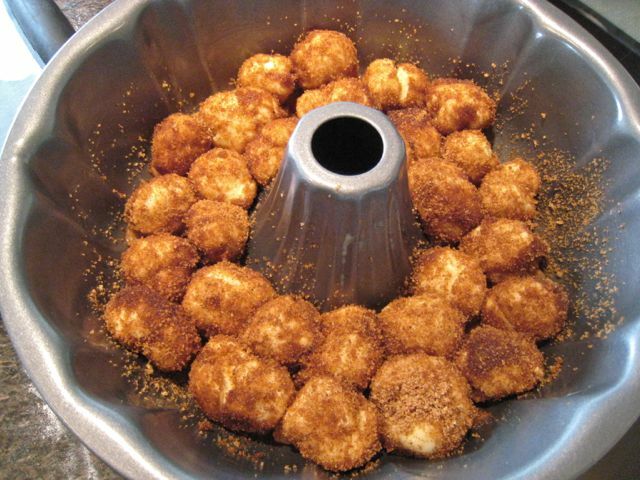 Continue with “Assembling the Monkey Bread” below. If you want to make the monkey bread on the same day, after you’ve finished kneading the dough in the stand mixer, turn the dough onto a clean counter and knead by hand for about a minute to form a smooth round ball. 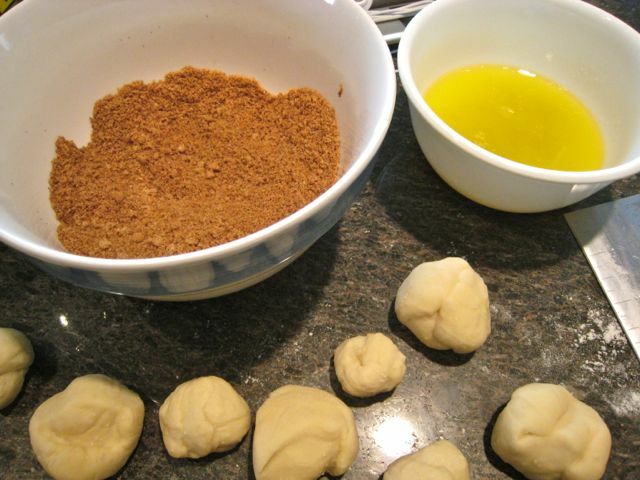 Place the dough in a lightly oiled bowl and wrap tightly with plastic wrap. Let rise in a warm place until doubled in size, about 1 to 1 1/2 hours. Lightly grease a large tube or bundt pan. 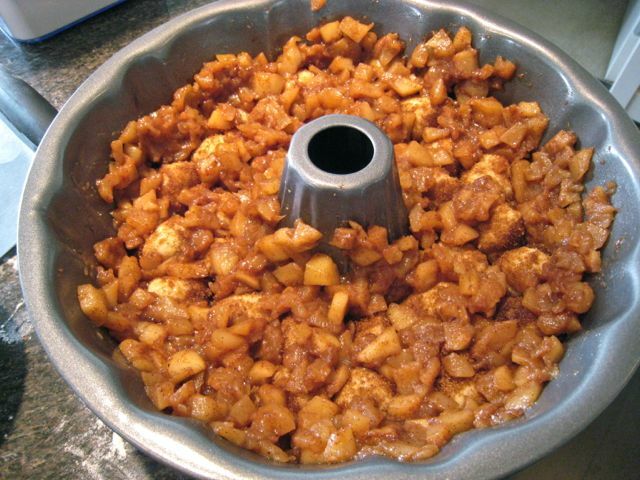 Sprinkle the bottom with some of the sugar cinnamon mixture, then cover with an even layer of the sauteed apples. Combine the butter and vanilla in a small bowl. Combine the sugars, cinnamon, nutmeg and salt in a separate bowl. 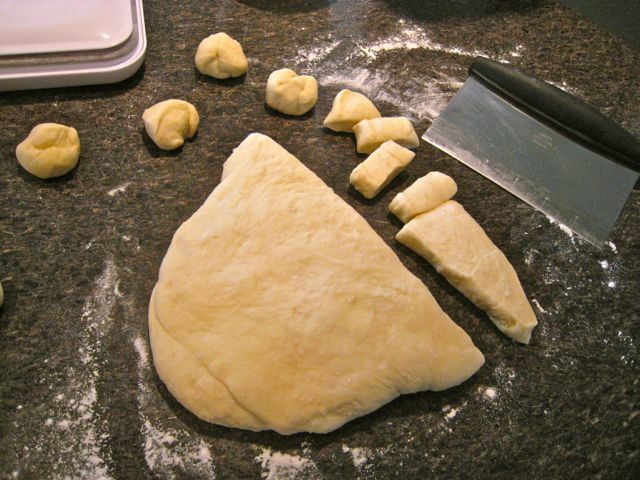 Turn the dough out onto a clean work surface, divide it into 36 even pieces (I didn’t bother counting my pieces as I worked – I just tried to make sure they were all relatively the same size). 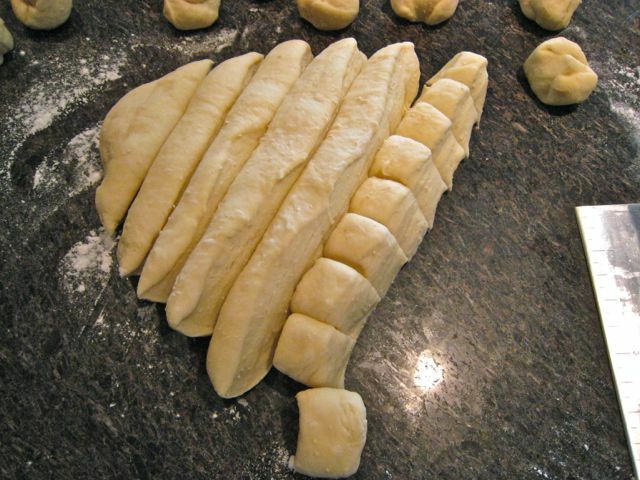 Working with one piece of dough at a time, roll it in your hands into a tight ball. Dip the ball of dough completely in the butter, then transfer it to the sugar mixture and make sure it’s evenly covered. Place the balls of dough in the tube/bundt pan, staggering them as you go. 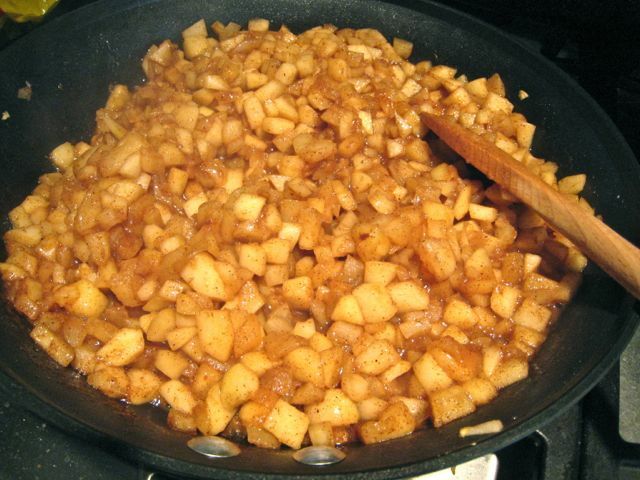 When you have one layer down, place some more of the sauteed apples on top, pushing it up against the side of the pan. Cover the rest of the dough with butter and the sugar cinnamon mix and place in the pan. 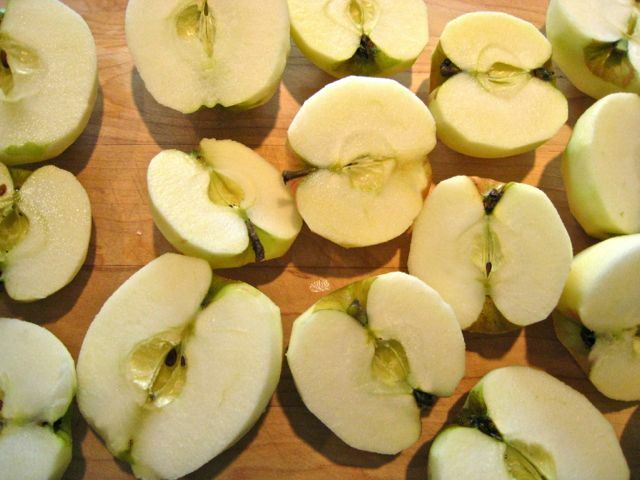 When the second layer is complete, cover that with more of the sauteed apples. Wrap tightly in plastic wrap and allow the dough to rise in a warm place until doubled in size (approximately 1 to 2 hours). Preheat your oven during the last few minutes of your rising time to 350 degrees F.
When the dough has doubled in size, place it in the oven and bake for 30-40 minutes. Let the bread cool slightly before removing from the pan and serving. Verdict? I thought these were “not bad.” The brother ‘n sister-in-law were over for dinner and they said this was pretty tasty. I guess I’m just really hard on myself when it comes to the things I bake. The flavours were incredible – you got a major hit of brown sugar, cinnamon, and apples with every bite. It’s like eating tiny, pillowy bites of autumn. My biggest gripe was the doughiness of the bread – I may have under baked this a bit. The crispy balls from the top of the bundt pan were the best pieces because they were fully cooked through and satisfyingly crunchy. Sunday Supper this week is being hosted by the fabulous Cindy of Cindy’s Recipes and Writings. Be sure to check out her site along with the rest of this amazingly drool-inducing, apple-licious line-up!